Euro Lottery - Mr. Brisse Backman. We acknowledge receipt of your duly completed Claim Verification Form, After formal verification and scrutiny exercises, you are found qualified to receiving payment of the stated lottery prize. 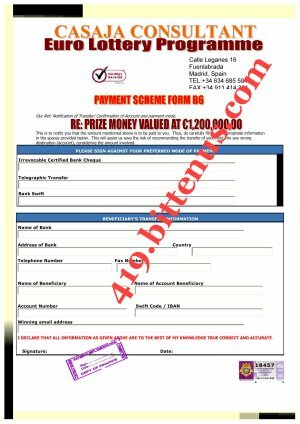 We shall proceed to conclude the payment processes of your lottery prize and your winning money of €1,200,000.00 (One million,Two Hundred Thousand Euro only) shall be confirmed to you in your stipulated mode of payment within 3 working days. The Municipal Court of Madrid, Spain, has requested you to be at the court on the appointed stipulated time below. You are therefore been invited to come along with the valid Identification proof (as you have indicated in the Claim Verification Form), asTuesday the 13rd day of May 2008 has been confirmed for you to come to Madrid,Spain for the signing of the Release Order of your winning prize money whileyou are also requested to come to The Municipal Court of Madrid on Monday, the 12th day of May 2008 for the Notarization of your winning prize at the Court of Justice, Madrid in preparation for the signing ceremony and Release Order of your winning prize the next working day Tuesday, the13rd day of May 2008, as they both, cannot be effected the same day. Endeavour to send your flight schedule so that our Protocol Officer can pick you up from the airport to our office, as your appointment is for 10.00am local time, Please, note that your inability to honour this appointment should be communicated to this office as soon as possible, so that alternative arrangements could be made for you. (c) Payment receipt of€1,250.00 (One Thousand,Two Hundred and fifty Euros Only)confirmation for your Notaris. All documents obtained after the signing of the Release Order will be forwarded to you immediately, on receipt. A, “Notarial or Notarization” means documents that a Notary Public Officer of Spain assigned with the International Court of Justice – Madrid, Spain is authorized to perform under the law of Federal Financial Supervisory Authority (FFSA) in Article 43-2001 of Notarization in Spain. B, Upon the “Notarial or Notarization” a Notary Seal legalizing the fund for release to you in your preferred mode of payment will be placed on the notarised documents by the Notary Officer at the Municipal Court of Madrid – Spain. In the Notary Seal will include CERTIFICATION SEAL OF DOCUMENTS. C, The “Notarial Certificate” completed by the Notary Officer issued, bearing the Notary’s Officer signature and Seal will be released to you by the Notary Officer upon the payment of the Mandatory Notaries Fee €1,250.00 Euros, and the “Notarial Certificate” will also state the facts attested by the Notary Officer in the Notarization. If youwill not be able to honour your appointment, the Head of our Legal Dept., Advocaat Lorenzo Nadel will represent you at the Municipal Court of Madrid, Spain to sign and collect all relevant documents on your behalf so as to expedite the payment of your prize fund by our paying Bank to your designated Bank account, as you will indicated in the Payment Scheme Form B6. You are required to make the payment of the obligatory Notarization Fee of €1,250.00 (One Thousand, Two Hundred and Fifty Euros Only), before we would proceed in concluding the documentary procedures and your winning prize subsequently remitted to your designated account. This amount you will pay at the Municipal Court of Madrid, for the Notarissen of your winning documents, if you are opportuned to come on the appointed date yourself. 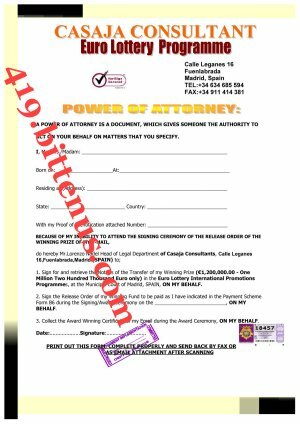 And when made, the copy of the Western Union Payment Confirmation Receipt of the €1,250.00, a duly completed Power of Attorney and a duly completed Payment Scheme Form B6 should be sent to this office, preferably through e-mail attachment. Once these are done, it will enable the Legal Deptof this company "Casaja Consultant" proceed to obtain the legalization document from the Municipal Court of Madrid after paying for the Notaris cost, conclude the documentary procedures, sign the Release documents on your behalf and subsequently your winning prize remitted to your designated bank account within 3 working days. For further clarifications if needed, please call on the undersigned. We hope, this will serve the purpose for which it has been communicated. We await your acknowledgement and prompt response.